Check-boxes - used when you agree to something e.g 'I am happy to emailed about this' and also for list choices such as a filter for results e.g show me hotel results with 'parking, wifi, lift access, swimming pool'. 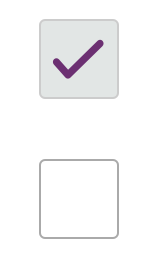 These choices are NOT carried through on a user journey say 10 days later and would have to be 'checked' again. All check-boxes are minimum 44px in width and height. It's a dated approach of doing things and too aligned to web and mouse use. Even at 44px the touch area is too small and the feedback from the interaction happens under your thumb, so not ideal. "Show me a decent app that uses checkboxes! ", one of them cries! "No one does this!" :D Maybe he has a point? "iOS design guidelines do not do have check-boxes, so we shouldn't either." I am making the assumption that the user see iOS toggles as a switch that will remain 'on' or 'off' foreseeably, until they choose to interact with it again. Therefore I feel it should be distinguished with a different interaction when this is NOT the case. However am I fighting the iOS system and standard Apple behaviors here? To introduce an interaction that is not (supposedly) optimized for thumbs on a mobile device? Hmmmmm. Any thoughts would be greatly appreciated. I'm not entirely familiar with the apple guidelines but in webapps I've been using both for different behaviours. If the action results directly when clicking/tapping the component, use a switch. If another element has to be clicked/tapped before the action takes effect, use a checkbox. Checkbox is very useful IF you have multiple choices to be selected. And also, it's really common for agreeing terms and condition etc. Toggle would be helpful for active/inactive function. Not the answer you're looking for? Browse other questions tagged ios checkboxes toggle app or ask your own question. Is there a better metaphor for a single-use checkbox? What are patterns for having user check correctness of data? How would you implement a Momentary Rocker switch in a mobile app or web page? Is lack of sound in game detrimental to experience? Different checkboxes - OK or NOK?